In 2011, Myron Mixon published his brisket recipe in The Daily Meal. The recipe, using Myron’s “Power Cooking” technique, has been passed around the barbecue forums and the reaction from folks that have tried it have been mixed. 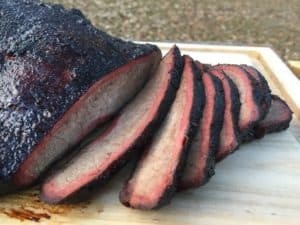 I was curious why more folks weren’t having success with the published recipe so I did some sleuthing and came up with five additional details on Myron’s brisket recipe that were not included in the original article. If you have been struggling to cook a brisket like Myron then these these extra details might be what you need. Trim the brisket to remove most of the fat between the point and flat while leaving a layer of fat on the point. Place the brisket in an aluminum baking pan and inject it on 1-inch squares all over the brisket and injecting half of the beef injection in those squares. Flip the brisket over, fat side down, and pour the remaining injection/marinade over the meat. Cover and refrigerate for at least 6 hours or overnight. Heat your smoker to 300 degrees. Dry the excess marinade from the brisket apply the beef rub all over the meat. Place the brisket in a clean aluminum baking pan, place the pan in the smoker, and cook for 2 ½ hours. Remove the pan from the smoker and cover it with aluminum foil. Put it back into the smoker and cook for another 1 ½ hours or until the temperature in the point end of the meat reaches 205 degrees. Remove the pan from the smoker and wrap the pan, still covered with aluminum foil, in a thick blanket. Let it rest at room temperature for 3-4 hours. Okay, those instructions are pretty good and I give Mr Mixon much credit for sharing them. Here are some details that got left out which will should make this method method even better. These updates came from Myron’s 2016 BBQ Brisket Demo YouTube video and a 2014 Ask Me Anything session he held on Reddit. For the first section of the cook the brisket is NOT in a foil pan as indicated in the Daily Meal article. Instead it is directly on the grate. This is important because if you have the brisket in a foil pan at the start of the cook it will make it harder for the smoke to find the meat. In Myron’s Hot and Fast technique the brisket is only exposed to smoke for one and a half to two hours. You need to make that time count. For the first section of the cook keep the brisket on the grate and out of the pan. The 8:30 mark of Myron’s YouTube video. The following question from the Ask Me Anything discussion. Myron prefers to smoke briskets with a combination of oak and hickory. He starts his fire with lighter fluid soaked charcoal but that’s only to get a coal bed going that will light his wood splits. In his video (8:45 mark) Myron essentially says to use whatever wood is available to you and that lots of wood types are great for brisket. That being said, Myron can use whatever wood in the world he wants and he wins competitions with oak and hickory. Myron also confirmed he uses hickory and oak in the AMA question above. Competition barbecue is all about the details. One detail that Myron is adamant about is that you should inject brisket along the grain of the meat. Whether you inject with or against the grain has ZERO influences on the flavor or moisture of the final product. The direction of the injection does influence the appearance of the brisket as injecting against the grain can leave streaks in the meat. The 5:30 mark of Myron’s YouTube video. After the first hour of smoking Myron spritzes his brisket every 15 minutes with a mixture of beef broth and brown sugar. The spritz is used to help the brisket get a caramelized crust. When you cook as hot as Myron does you have to be careful about sugars burning. By spritzing every few minutes with a broth and sugar solution Myron is able to carefully build a nicely formed bark without worrying about the sugar burning and getting bitter. The spritzing step is NOT included in the original recipe from 2011. The 9:50 mark of Myron’s YouTube video. The original recipe does state that you should rest the brisket for 3-4 hours. What it doesn’t do is tell you that, after meat selection, this is the most important step in the entire process! Myron also emphasized the importance of resting in his response to the Reddit AMA question below. 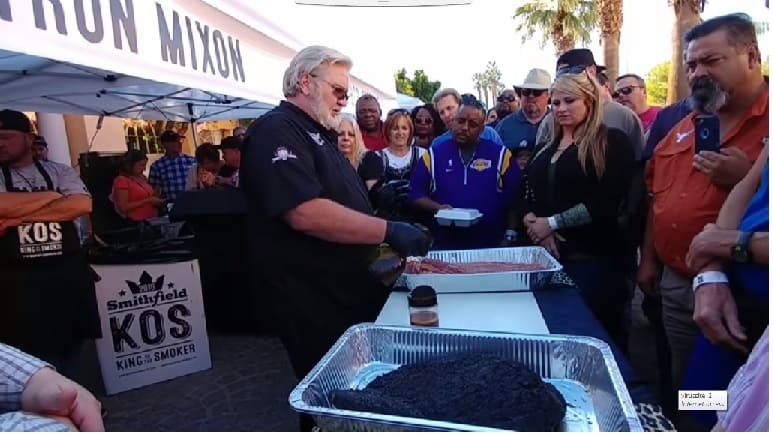 Question: Myron, when you’re doing a competition how long is it when you take the meats off the cooker to rest between turn in time? Like how long do you stick it in the warmer/cambro or whatever you use? MyronMixon: On Boston Butts, I like to rest at least 4 hours. Same thing with Brisket. Resting is the biggest part, for me, of making a great piece of meat. it’s important to rest. On big meats, 4 hours. I have done some poking around but haven’t figured out what type of knife Myron uses for slicing his brisket but I strongly suspect it is a granton style slicer that many folks believe is the best knife for briskets. Here is the link to the Reddit AMA session. Here is Myron’s video..the language is pretty salty. How much brown sugar to the beef broth for the spritzer?? I have tried to find the exact ratio but haven’t had any luck. My guess is that it is on the order of 1 tablespoon of brown sugar per cup of beef broth. Great info from the man himself! How does Myron get any bark if he “pans” the brisket after only 1.5 hours? I would think that the brisket would be practically steaming in it’s own juice. I am guessing it is related to the sugar based spritz that he uses. Maybe he builds up a fast bark that can hold up against the steam?